Mee Rebus (literally boiled noodles in English) is popular in Singapore and Malaysia. The best of "Mee Rebus" can be found among the stalls in Geylang Serai market hawker canter. The dish is made of yellow egg noodles, which are also used in Hokkien mee, with a spicy slightly sweet curry-like gravy. The thick gravy is made from potatoes, curry powder, water, salted soya beans, dried shrimps, and peanuts. 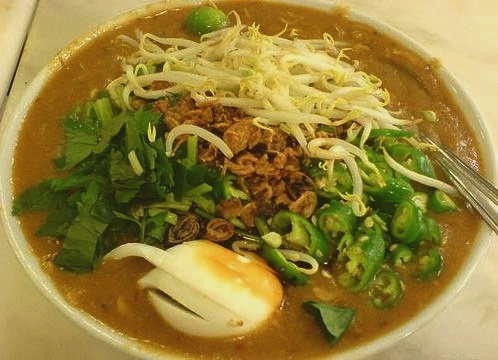 Mee Rebus is garnished with a hard boiled egg, calamansi limes, spring onions, Chinese celery, green chillies, fried firm tofu (tau kwa), fried shallots and bean sprouts. Some eateries serve it with beef or mutton, though rarely found in hawker centres, or add dark soya sauce to the noodles when served. The dish also goes well with Satay. Heat Vegetable Oil in a pot and stir fry the Paste, till light brown. Add in Meat Curry Powder Paste, mix well, and then add in the Beef. Render all ingredients in pot well. Add in fermented Soy Bean Paste (Taucu or Tao-cheo), and saute the Beef until the oil begins to surface. Add in water, Cubed Tomatoes, Galangal, Mashed Potatoes, and Mashed Sweet Potatoes. Stir until the Mashed Potatoes and Mashed Sweet Potatoes dissolve into soup. Add in Celery, Toasted Pounded Peanuts, and Tomato. Stir evenly and let simmer for approximately 20 minutes until the gravy thickens and meat becomes tender. If gravy is not thickening, add in some cornstarch to thicken it. Mix a tablespoon or two of cornstarch and mix them thoroughly with some water, and pour into the gravy. Serve gravy with the Garnishing Ingredients. if i eat mee rebus, i will ask for lots of taugeh and green chillies. i would prefer sunny egg instead of the hard boiled egg. This dish was fantastic. I can’t speak to its authenticity, but it was delicious and that’s pretty much what counts for me. I found the spiciness just right and I think it clearly lends itself well to variation, which is always nice. Thanks! You are wellcome. Serve hot and add lots of chopped green chillies for the extra "kick" if you dare! Thanks to Chef Wan. I think this version of mee rebus is authentic and tasty. Instead of beef, can I use Pork? Hi Zhong Guo, traditionally Mee Rebus is a popular Malay culinary creation which uses shrimp, mutton or beef for the curry base. This recipe doesn’t use pork. anyone managed to cook this mee rubus successfully? I am looking for someone whom is willing to teach how to cook it so that I can start a small business with it. Do email me at bpchew@singnet.com.sg if there is any kind soul that is willing to help. Hi, how much is 5 small packs of curry powder in gms? Are there supposed to be dried shrimps in this recipe. You’ve talked about it in the introduction, but it is not in the ingredient list or the directions. And how much is 5 small paks of curry powder in gms? Can you make the mee rebus stock ahead of time and re-heat on the actual day you want to eat it? Also, how many servings does the recipe call for? Salaam sis, do you hv any vidz at youtube pls give me ur link….